What do we need to shoot a Street picture? Whatever kind of a camera is good. Either it is a ridiculously expensive rangefinder or an unbelievably cheap point and shoot compact. Either it shoots digital or it shoots film. Either it weighs a ton or it weighs few grams. ANY camera is fine as long as you have it with you. The most expensive rangefinder or SLR is completely useless if it's been left at home! So...Carry a camera. Always. This can be out in the streets or at the beach or inside a hotel's lounge or in a diner place or inside a supermarket or a mall or a school or whatever PUBLIC place. This public place must be visible in our picture. And things must be happening in this public place. Exactly, people! We need people in candid, unstaged situations. Definition of "candid" from Merriam-Webster's online dictionary: "subjects acting naturally or spontaneously without being posed" Definition of "candid" from Wikipedia: "Candid photography is best described as un-posed and unplanned, immediate and unobtrusive. This is in contrast to classic photography, which includes aspects such as carefully staged portrait photography, landscape photography or object photography. Candid photography catches moments of life from immersion in it." a unique moment, an interaction between people and their environment or between people and people, a special "something" that is being happening in front of our eyes and it is worth capturing in a picture. There's nothing special in people strolling down a street if we can't focus our attention in something special that's being happening in front of our lens. We have the street, we don't have the people here. Here we have the people but we don't have the environment, the place. The moment is candid, unstaged but it's totally out of context. Both people and environment are present here, but there isn't really a strong interaction between them. Street photography is very much about composition. Sometimes colour can be distructing. Sometimes colour adds to the frame and is a vital element of it. Try both. Decide yourself what suits you better in every particular picture. Avoid selective colouring which produces totally unatural results and forcibly guides our attention to a certain part of the image. Avoid partly desaturating or tinting. "Street" needs no cheap frills which make a good image bad and a bad image worse. "Street" needs to be raw, as much straight out of the film or the sensor. Very often, the line between Street Photography, Photojournalism, or Portrait Photography is very THIN and responsible for endless arguements. Many times there are subtle differences between these three genres and images may belong to 2 or even all 3 of them. I have a simple rule in my mind which usually helps me differentiate them. If an image has the potential to be published in a newspaper as "news", it's Photojournalism. If the subject(s) is out of context, it's a portrait. In the end though, it really doesn't matter which category an image falls in. and what about the right in one's own image? Dont we have to ask the people before we submit photos of them online? If you feel like asking, you can ask. The law says that in public spaces you can take pictures of anyone you like. For god's sake, we are taking pictures, we are not stealing souls as the native Indians believed. Thank you Stam for this article. It's concise, short and a very good guideline. Like the good boy I am, I faved it. εγω ευχαριστω που κοιταξες τις φωτογραφιες μου! τη συγκεκριμενη που εβαλες στη συλλογη σου δεν την ειχα καν στην κατηγορια street..! Nice, succinct, useful, and to the point. I love articles that are simply clearly stated. Great series I them all! Thanks for sharing. I totally love this article! The one man machine, Stam! I would love to do more street photography, but I am always worried people getting mad at me for taking their photos without permission. I think that is mostly due to doing photography work for newspapers and magazines too long where I was expected to get permission though. We are taking pictures, we don't steal souls for god's sake! Well I will see what I can capture then this week ! I'm not a street photographer, but i have a friend who goes for street photo-shoots and i sometimes spend time with him chatting and having ideas about how they capture their subject.. and believe me; the picture you posted as a bad example (the one with a lady waiting for the traffic to pass) it's not a bad example.. it has a story in it, it speaks about the busy life plus it has good composition also. I don't think that picture was meant as a bad example, but more probably for (color vs) b/w. oh, ok.. i see the point now. In a broader sense, every image has a story to tell regardless its gender. This is so useful. Very clear and simple wording, straight to the point without side-tracking. I have to re-do a street photography project because I didn't understand the basic principles of the....genre? But this has made it so much more understandable for me. Thank you. Awesome basic info any guidelines on getting permission? It depends on the country's laws the photographer is. From a courtesy perspective, do you have recommendations? I usually never ask for permission, unless if it's to use the image for commercial reasons which is something I've never done so far. In my country, one does not have to ask permission in order to photograph someone in a public place. I always try to respect my subjects and don't depict them in awkward positions, and I avoid shooting beggars and homeless people, unless the scene is an exceptional one. Asking for permission, provides you with a portrait not with a stret picture. Your subjects pose in front of the camera and the decisive moment is not there anymore. Ah, yeah I was thinking maybe after you take the picture, ask them if it's ok to post? Sounds like respecting should be enough though. Unless they just got off the public transit. It's fallen way behind in Chicago...only some areas have nice buses. Most types of photography can be easily defined by their subjects. A wedding photographer takes pictures of weddings. A portrait photographer poses someone and takes their picture. The nature photographer covers a wide area, but it is easy to categorize. Street photography is difficult to define because it can encompass just about any subject. A Visual Guide to Street PhotographyIt is my great pleasure to introduce you to a series of 5 articles about Street Photography made by the wonderful myraincheck and slightly edited by moi. Trying to define a genre of photography like Street, it implies the consciousness that one definition will never be enough, or exhaustive, or able to cover the molteplicity of its possibilities and situations. Nevertheless let's try to comprehend the philosophy behind the passion for street photography. Let's start stating that a street photo is not a photography of streets and it is not necessarily a photo taken in a street. So what does 'street' mean? Street is whatever background or surrounding, not staged, not posed by the photgrapher. And street is whatever photography which captures, explores humanity, the human behaviour, the relationships between individuals and between individuals and their surroundings. As we all know from the movie My Big Fat Greek Wedding everything was invented by the Greeks. Well, ok we left some trivial things to be invented by the Chinese as well. What you may not know is that Street photography was also invented by the Greeks before Photography itself was even invented. PE: dA Street shooters share their tips1. What is the gear that deviant Street Photographers use? 2. What is the dream gear that they'd wish to have? 3. What is the best advice they could give to an inexperienced street shooter? The answers are right below! 3: Shoot. A lot. Be inside the action, to feel what´s going on with small focal lenght, or step back to realize a worthy context, but never be afraid to press the shutter. Never. You´re doing nothing wrong. 1. I have a 5DmkII and an EOS300 (film). Both share the same 35mm f/2 lens. I use them almost equally. 2. I think the best camera is the one in your hand. I know it is a cliche but then again the problem most if the times is not at the camera but at the photographer. Let's close our eyes and imagine going out in the streets and looking for unusual things. What do we expect to find? People, first of all. 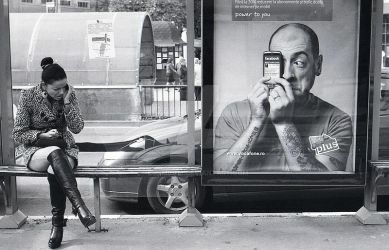 That's good, the HUMAN PRESENCE is a fundamental element of street photography. If we want to use only this ingredient, we'll be able to realize a true street photo only if the person we capture will have something unusual or interesting or is doing something unusual or interesting. Otherwise we'll have a good portrait, an enviromental portrait, a wide portrait whatever, but not a street photo. Tony Ray-Jones was an English street photographer. In the early 60′s he traveled to the U.S for studying for a Master of Fine Arts in graphic design at Yale. He moved to NY after graduating and got a job as an art director for CBS records but he was determined to become a photographer. In New York he became good friends with Joel Meyerowitz and became part of the NY street photographers scene led by Garry Winogrand. Jones kept notebooks, a journal if you'd like in which he wrote down his thoughts, lists and plans about photography. In one of those lists, titled "Approach" he listed some tips for better street photographs. These tip are still valid today and can be used as a basic guidelines to better street photography. PE:'So you think you can Street' ContestSpring is here! For many of us, street shooters, it's the best season to go out and shoot "street". And then come back and show what we got. "So, you think you can street?" which will be held from May 1st till June 15th in deviantArt site. Everyone is welcome to enter ! 1. Your entry must be a STREET photograph. If it isn't, it will be removed from the contest and you can replace it with one that it is. PE: Deviant Street Books-Inspirational linksFirst it was film, darkroom, paper. Then it became pixels, software, screen. And for some paper too. A big thanks to those who decided to let us enjoy their pictures in paper and get the feel of the real thing. It needs time, devotion and trust to set a street photo book of your own. Let's see who did it! It is a great pleasure and honor for me to be your host. Street Photography: The origins - Defining "Street"
First things first let's remember that street photography is not so much about the subjects as it is a style of photographing, a 'forma mentis', a way to think, see, capture images. A forma mentis that can be summed up in the ability of RE-INTERPRETING, RE-CONTEXTUALIZING, giving a different interpretation, placing in a different context, the reality around us, giving it an additional significant meaning. Goodbye Street GalleryIn few days, a whole year will have passed since the day I took over dA's Street Gallery as Street Community Volunteer. A neglected gallery, full of misplaced images, but also with many worthy submissions. I visited this galllery everyday, cleaning it (the 24h and 1month popular pages) and informing the photographers of the misplaced images (every single one of them), what Street is all about. At the same time, 3 days per week, I featured a worthy image as a Street Daily Deviation, taking in account your suggestions as well. The featured images were not necessarily the "best" of the featured deviants. My intention was not to feature "bests" but to draw the community's attention, to active Street photographers, both experienced and new to the genre, in order to boost their dedication to Street. I am content because a lot of times I succeeded. Photographing together human presence and surroundings, combining them in something interesting and unusual, we obtain the classic structure of a street photography. But mind you, it is not enough taking a photo with people and surroundings to have a good street photo! Remember that we have to strike, surprise, trigger an emotional response. And that we can do CONNECTING people and surroundings. Street and neighborhoodSometimes deciding if a photo fits Street category or not can be really quibbling. Categories mean nothing outside this place (or other art sites) and mean nothing about the value or quality of an image. Though they are useful to make it easier to see, discover, find street images. I hope that these few lines will be able to clear some of the most common doubts in submitting to street category, and would spare you flipping a coin before submitting. So let's try to set some limits to street photography, even knowing that the edges between street photography and other neighbors genres of photography will ALWAYS be thin, vague, and often subjective. ENVIROMENTAL PORTRAIT, SPONTANEOUS PORTRAIT OR STREET? What is the difference between enviromental portrait or spontaneous portrait and street photography? A street photograph is not posed. If the portrait is posed it is not street (whoa I made a syllogism). Aspect Ratio, Composition, Present and FuturePhotography is simply a technology that allows you to record a moment in time, in a box that simply captures a moment of light. Simple and basic as that, no myth there. But the decision on how to capture that moment and its variables like composition, time and subject matter remain in the hands of photographer. Let's talk about that box, how it affects composition, and the time we live in. Photographic technology has developed at a rapid pace. From the 19th century's cumbersome daguerreotypes to today's compact digital cameras, photography has become one of the most accessible art mediums, but more related to motion pictures that we might think, being at the same time influence and influenced by each other. from "Queen of Silhouettes" to "The Girl with the Pearl Earring"
Hello everybody,this month we are together with wonderful photographer Iryna :iconIFedorovskaya:. In her galleries you will discover the magic of the light and admire how smoothly she handles it. In conjunction with my dA friends I have compiled a booklet of advice and information on laws in relation to street photography around the world. If you have relevant info on countries not listed or have noticed errors, then please leave a short and concise note to me here. Please try to include a link to a reputable webpage for confirmation. This may be added to this booklet in a future edition. This is a term that refers to the way the lens blurs the image and the aesthetic quality of that blur. Some lenses cause the image to blur that is pleasing to the eye, whereas others blur in a more unpleasant or distracting way. It is considered good practice to have the subject of the image in focus, while the background is blurred. Bokeh occurs in the part of the image that lies outside the depth of field and photographers sometimes use a shallow focus to make the out of focus regions more prominent. This refers to how much of the scene is in focus. In portrait or macro photography, it is better to have a shallow depth of field and keep only part of the image in focus, as opposed to landscape photography where you'd generally want a larger depth of field and keep everything in focus. Project Educate: Composition BasicsThe action of putting things together; formation or construction. The term composition simply means 'putting together' and is applied to all forms of art. In this respect, composition is all about the placement, arrangement or organisation of the individual elements within a photo. The composition of a photograph is what catches the viewer's attention and is what makes the image pleasing to the eye. By practicing and developing basic composition techniques, you can produce pieces of work which can recreate the impact of the original scene. Project Educate: Aperture, Shutter and ISO SpeedToday we'll take a quick basic look at Aperture, Shutter Speed and ISO Speed. The aperture determines the amount of light that is allowed into the digital sensor. A small number indicates a large aperture whereas a large number indicates a lower aperture. For example, an aperture of 8 would let in less light than an aperture of 4. Imagine your eye, specifically your pupil; the bigger the pupil is, the more light is being let in and the smaller it is, the less light. This is what is effectively happening with your camera. The aperture also determines the DOF (depth of field). The larger the number, the less light is allowed in. Each number depicts double the amount of light allowed through the lens. For example, an aperture of 5.6 will allow twice the amount of light in than 8, but only half the amount of light than 2.4. When was the last time a random passenger in a bus made your jaw drop? Happens with me all the time! Whenever I go out into the streets, I never plan on what I'm going to shoot, nor do I have a particular theme in mind. Mind you, planning ahead is highly benefical to a Street Photographer or any photographer for that matter - a practice that almost always yeilds excellent results when properly utilized. For me, it's just the sheer excitment of stepping into a vast concrete jungle, unsure about what's around the next corner, or perceiving an event that is about to unfold before you, the sound of your heart beating as you walk/run towards the developing scene - all the while hoping that you get there in time to take... that one shot, that ultimate payoff; is all that matters. Sometimes you could be standing there observing a street scene when you begin to notice things falling into place; a photo opportunity forming right before your very eyes. Talking about an 'artist's toolbox' for street photography is simple and difficult at the same time. It is simple because basically to take a street photograph all you need is a camera. Street photography is about seeing and reacting, you don't 'make' a photo but mostly you see, find, seize it. Project Educate: Photographing Infants + ChildrenPhotographing infants and children can either be really painful and frustrating, or incredibly fun and rewarding. It depends entirely on the child. I kid, sort of. It's what you make of it and how you treat the moment. Children are fast, sometimes moody, sometimes hyper and nearly always think they know what you want them to do when you turn the camera on them. Either run, or crack that huge fake camera smile that they've been taught to do for their school photographs. Don't force a smile. If the child doesn't want to smile, don't make them. You'll end up with the fake smile. However having said that, you can try and be funny, but again don't push it. They're smarter than many give them credit for. If you're not getting a smile but you're getting a rude funny face, then accept it. Those sorts of shots can be awesome as well.